Three high school students were selected recently to participate in the Ohio Supercomputer Center’s Summer Institute program. 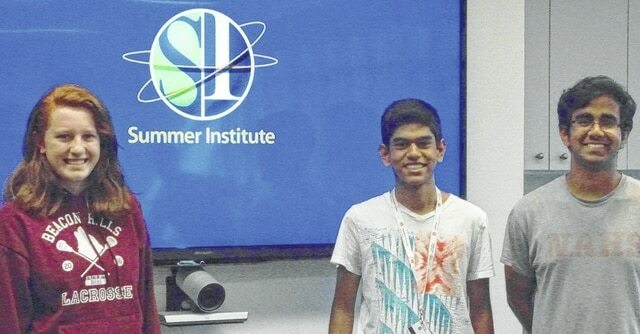 Shivatej Dubbaka, Elizabeth Halter and Divyadita Shrivastava were selected, along with 17 other students from around Ohio, to participate in the June 14-26 camp at the Ohio Supercomputer Center at 1224 Kinnear Road in Columbus. Halter learned about the program from her older sister, Sophie, who participated in the program twice. The program gives students who are interested in science, technology, engineering and mathematics (STEM) fields to do research on real-world issues using supercomputers. The Summer Institute also provides a glimpse of college life. Students stay together in dorms under adult supervision and get a taste of what it’s like to be a college student. Students also get to tour some of the research labs on the Ohio State campus. For example, some of the students sat in on a discussion between grad students and professors in the astronomy department at Ohio State on Tuesday. The 20 students were divided into five project groups, which focused on lab-on-a-chip nanofluidics, image processing, cancer cell migration, network design and engineering, and the physics of addicting video games. Dubbaka, a sophomore at Olentangy Liberty High School, worked with the group focused on image processing. Halter, a senior at Olentangy High School, worked with the network design and engineering group. She said that she’s interested in applying to Ohio State, Purdue, Northwestern, Georgia Tech and Cornell to continue her education. Shrivastava, also a senior at Olentangy High School, worked with the nanofluidics group. Shrivastava provided an impressive description of the project that his group is working on at the Summer Institute. “This may seem to not make sense at all, but what scientists right now are currently trying to do is take all the materials that you find in a regular lab – when you’re running blood tests, pathologies and all of that stuff — and be able to put it on a chip,” he described. “Let’s say that you were trying to get diagnosed with heart disease – obviously really extravagant goals. Instead of going to a lab, ideally you have a device that you can hold in your hand that takes a small sample of your blood and is able to diagnose you with a hundred percent accuracy. He said that he will be applying to Ohio State, but that MIT “has always been a dream.” But with the description that he provided about the nanofluidics project, that dream could be a reality. Shrivastava missed the application deadline last year, something that he didn’t want to happen again. Students presented their projects to parents and family members as well as scientists, staff members and Summer Institute alums at the end of the two-week camp. The Ohio Supercomputer Center is a member of the Ohio Board of Regents Ohio Technology Consortium. It has hosted the Summer Institute since 1990. For more information on the Ohio Supercomputer Center, visit www.osc.edu. For more information on the Summer Institute, including photos of the participating students, visit www.osc.edu/si.